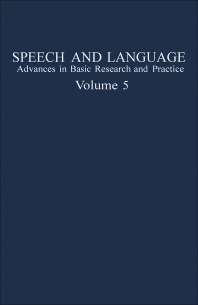 Speech and Language: Volume 5, Advances in Basic Research and Practice is a collection of papers dealing with clinical issues, theories, and pathology of language and speech. Several papers discuss developmental apraxia of speech, relapse of stuttering therapy, the single subject research design, and the implications of the physiologic, acoustic, and perceptual aspects of coarticulation. Other papers analyze language development, language training, the three aspects of voice quality element, and the issue of disputed communication origins. One paper notes that intervention programs for stuttering produces mostly short-term benefits. The paper discusses the known risks of relapse following the end of stuttering therapy and the independent variables that influence this risk. Another paper examines voice quality in terms of perceptual, acoustic, and physiologic features of the different voice modes. By using the "Black Box" model, in which frequency, intensity, laryngeal waveform, pharyngeal prefiltering, and formant frequency can be controlled, the paper shows that a measure of interaction among all the controls exist. For example, a voice mode represented by a laryngeal waveform and pharyngeal prefiltering still interacts with frequency and intensity. Therefore, knowledge of the differences in physiology that attend to each voice mode can be valuable in effecting changes in voice production. The collection will prove valuable for linguists, speech therapists, neurologists, neuropsychologists, neurolinguists, speech pathologists, or investigators whose works involve linguistics, learning, communications, and syntax.